During World War II, Major John J. Mohn served as Captain of the 106th Division, 422nd Infantry, 1st Battalion, HQ Company. He was taken prisoner at the Battle of the Bulge in December 1944, along with 7,000 other men, the second largest surrender of World War II. His story is a unique journey across Europe, as prisoner camps were too full and the German officers were unsure what to do with the prisoners. Mohn was prisoner from December 19, 1944 to May 2, 1945. During these 5 months, he was forced to walk across Germany and Poland totaling 1,200 miles. He was liberated three times, twice being recaptured. Read this first-person account of the hardships, the terror, the survival, the humor, and the hope of a P.O.W. in Germany during the last days of World War II. 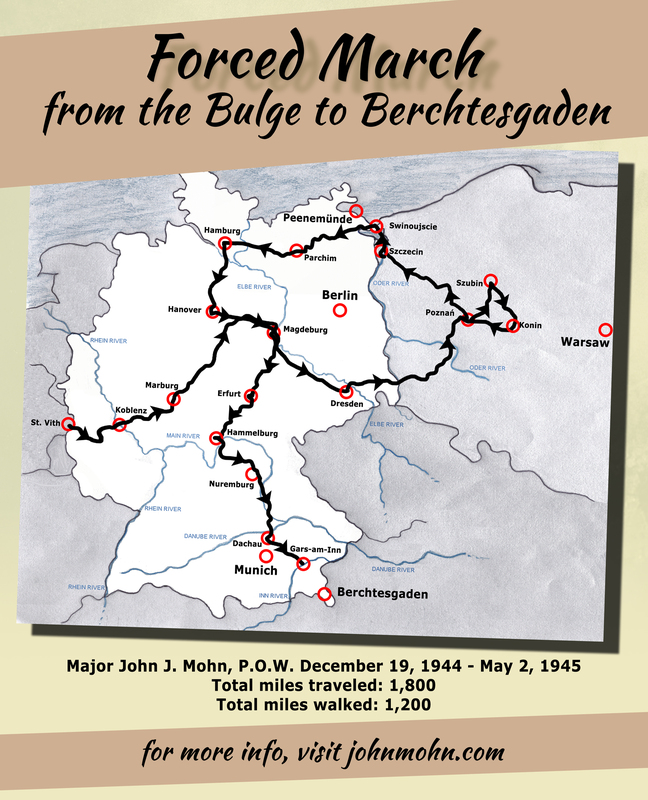 John Mohn recorded his memories of World War II and his POW experience in a memoir, which was to be published in the early 1990s. Unfortunately the publisher doubted several of Mohn’s experiences, even though they were documented. Mohn pulled the project, placed the memoirs in a box, and forgot about them for 10 years. His granddaughter, Mandy Altimus Stahl, resurrected the story in 2003 for a documentary on her grandfather, called “John Mohn: POW in Question” (see Youtube to view) She interviewed Mohn, gathered documents, and proved that his story was true. Unfortunately John Mohn passed away in January 2005. His book has never been published. Until now. 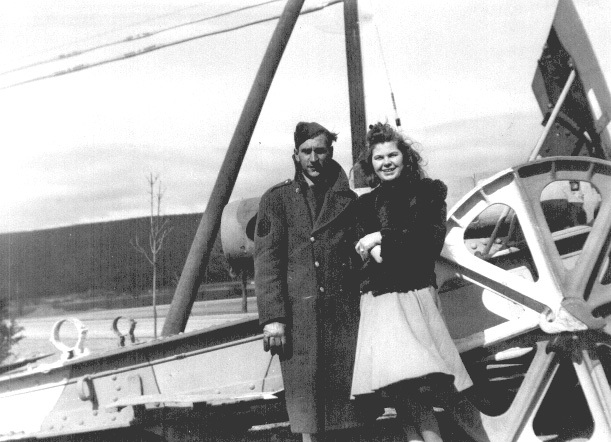 His daughter, Deb Mohn Altimus, Rick Altimus, and Mandy Altimus Stahl teamed up to share this memoir with the world in 2015, for the 70th Anniversary of the end of World War II, and John Mohn’s liberation. This book is now available to purchase below. Books will also be available for purchase after every lecture given. Click here for a lecture schedule. Should you have any questions, please contact Mandy Altimus Stahl, 330-704-7631 or by email. 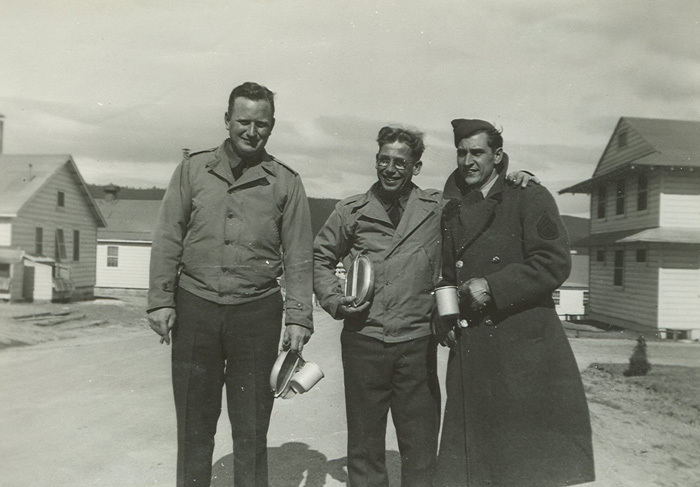 John Mohn (far right) with friends, Indiantown Gap, Pennsylvania, 1942. I knew John Mohn through his daughter Deb. He was a kind, loving man. A remarkable story of his service to our country. John Mohn was a wonderful human being and also my brother-in-law. He was always very kind and helpful. Always honest. Throughout the years I would hear some of his stories and was always amazed at how he was able to survive. John was a wonderful husband to my sister Cheri and a wonderful father and grandfather. He has been missed greatly since his death. Many thanks to John for all his service to our country. I am so looking forward to reading this book. Thanks to Mandy, Debbie and Rick for making all of this history available. My Forever Hero, your Father.